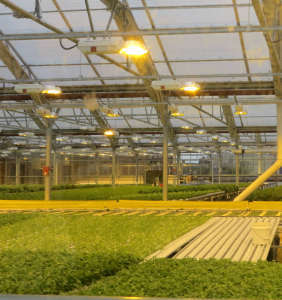 The edible rooftop was incredible, but all the other attributes made the store an outstanding example of pushing the envelope on sustainability into a realm that is testing new ideas and making them plausible and perhaps even feasible for future forward thinking real estate projects. Having a few moments to look out over the Whole Foods grounds from the second store outdoor balcony before our tour began, I took in all the advanced thinking, cutting edge innovations and was energized by new possibilities in future development projects. J’aime Mitchell our Whole Foods guide began by talking about the store’s infrastructure, which is mundane to many and often doesn’t get the respect it deserves, except from engineers like me. Only 5% of the on-site stormwater runoff leaves the project site, as the rest is captured for re-use or infiltrates. The parking surface is built with porous pavers, which immediately return rainwater into the ground and eventually the canal. 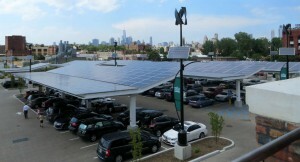 Cars are parked beneath solar panel canopies that meet 25% of the store’s energy needs, but also serve as a rainwater collection system. The captured stormwater flows and in-store hand-washing wastewater are directed to a large storage tank beneath the parking lot creating a graywater system that is cleaned and filtered and used for toilet flushing and irrigation water. The stormwater and graywater management systems are impressive as water was used twice, but there was more! 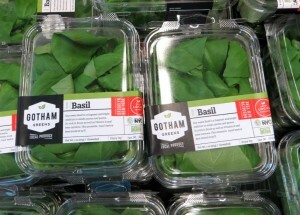 In the produce section, Gotham Green products are featured along with a multitude of other locally grown fruits and vegetables in an interior setting designed to recognize the region’s historic past. Brick facades were evident throughout the store such as in the upstairs bar/eating establishment and adjacent to the produce section that were repurposed from a Newark, New Jersey Westinghouse factory that had been razed brick by brick. Board walks and building materials from the ravages of the Superstorm Sandy were crafted into benches, wainscotings, and produce bins rather than landfilled. Admirably, Whole Foods took historically significant materials from tragedy and times past reintegrating them into a vision of beauty and purpose. Finally, the Brooklyn Whole Foods took the initiative to install a refrigeration system that only uses carbon dioxide rather than more typical synthetic refrigerants. Reaching back into early 1900’s technology, European and Canadian grocers have been thwarting conventional synthetic refrigeration systems as they can leak into the atmosphere and are detrimental to the environment by hurting the ozone layer or contributing to climate change or both. 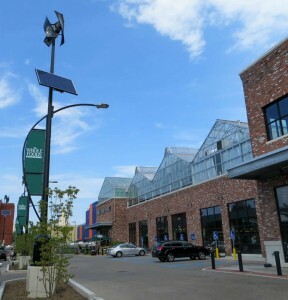 Whole Foods has now joined this trend and installed their first “old is new” carbon dioxide refrigeration system. One aspect of this system is the refrigerated products being protected by clear, plastic, vertical drapery which allow the coolness to stay in the case rather than chill the aisles. Customers must reach through the curtain to their milk or other perishable product, as I did as a child. Besides all the environmental and sustainable innovations, the store was light, airy, and inviting. Once back in Seattle, I couldn’t stop talking about the incredible Whole Foods–Brooklyn and how it is pulling the future of sustainability, reuse, and locally-grown into today.